at about five feet from the ground, accessed through a wooden ramp, originally retractable, resting on stone shelves, and is now available to visitors free of charge. Near the fortress, on the path leading to Santo Stefano di Sessanio, there is the church of Santa Maria della Pietà, a temple erected in 1596 on the site where, according to legend, the local population had the best on a band of brigands. The church, probably based on a pre-existing Renaissance venue, features an octagonal outer structure with a sacristy-style setting resting on one of the façades and an eight-coloned dome. The interior, articulated on a Tuscan parade system, features a painting depicting the miraculous Virgin and an armed San Michele sculpture. The church, now used as a simple oratory, is a destination for devotees and devotees. The village is located in the hinterland of Abruzzo, in the southern part of the massive Gran Sasso d’Italia, below the wide plain of Campo Imperatore, in a panoramic position towards the valley of the Tirino on one side and the low Conca aquilana on the other , At an altitude of just over 1200 m asl. The territory of the commune extends north along the Campo dell’Imperatore plain to reach the group of Monte Prena, the highest elevation of the commune. To the north just below the village opens a small plain overhanged by mountains, used for the cultivation of potatoes and legumes including the famous lentils of Santo Stefano di Sessanio, in addition to the presence of a small lake with canneto fed by the melting of the snow. It is reachable from the highway 17 by turning in close to Barisciano. The first news of contrade included in the commune territory of Santo Stefano di Sessanio owned by the monastery of S. Vincenzo al Volturno we are precisely at the Chronicon Vulturnense and date back to the beginning of the IX century. The first reliable news of the existence of the settlement called Santo Stefano is 1239. The capillary work of monastic orders leads to an increase in the cultivable land, the repopulation of high-altitude campaigns, and the birth and consolidation of fortified villages, the safest as they are in the highest position. 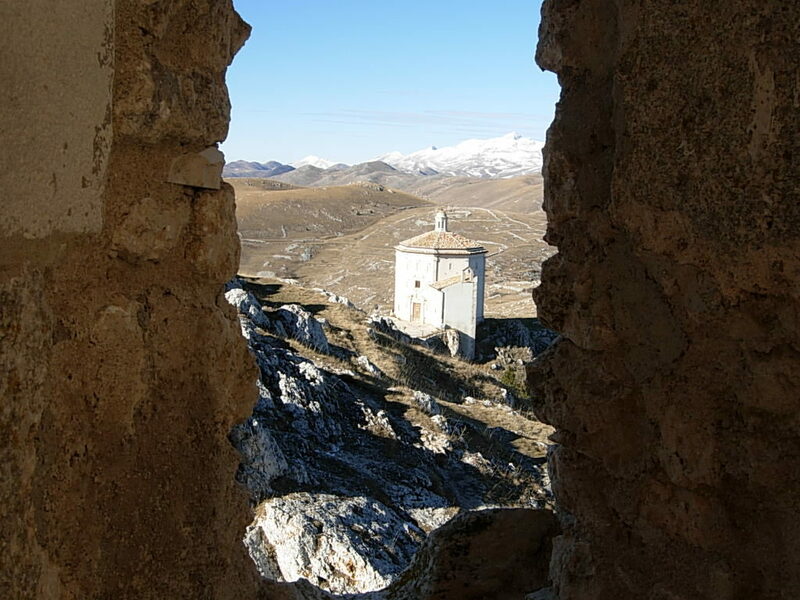 From the 13th century, Saint Stephen was included in A feudal district named Baronia di Carapelle which also included Carapelle Calvisio, Castelvecchio Calvisio, Calascio and Rocca Calascio. Santo Stefano followed the historic events of the baron until 1806, the year of the abolition of feudality. The village became dominant in the order of the families Pagliara, Plessis, Colonna, Celano, Caldora, Accrocciamuro, Todeschini Piccolomini, Piece, Cattaneo, Medici, Borbone. 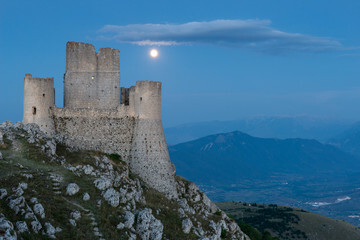 In 1474, under the Aragonese, the abolition of the tax on animals and the reorganization of the pastures of Puglia allow for a strong development of sheep and goat meat to the point that in that year Santo Stefano, Calascio, Rocca Calascio and Carapelle have in the customs of Puglia Well 94,070 sheep. Constance, the only daughter of Innico Piccolomini, handed the Baron of Carapelle to Francesco I de ‘Medici Grand Duke of Tuscany in 1579. These lands will belong to the doctors until 1743. During this period Santo Stefano reaches the highest splendor as the base of the Signoria Florence for the flourishing wool trade “carfagna”, here produced and then worked in Tuscany and sold all over Europe. In the 19th century with the Unity of Italy and the privatization of the lands of the Tavoliere delle Puglie, it ended the millennial activity of transhumance and began a process of decadence of the village which sees greatly reduced the population due to the phenomenon of emigration. In the 21st century the ancient village is having a revival, thanks to tourism, motivated by the policy of the mayors who have followed, thanks to the will of the few young people who have voluntarily given their contribution to the site since the end of the years Sixty to date and thanks to the initial investments of residents. In 2004, a young entrepreneur, Daniele Elow Kihlgren of Swedish origin, who bought a small part of the hamlet to make us a widespread hotel, came to the country and attracted the interest of other investors by advertising, developing in a way Considerable all activities in the area.